Just bumping this back up to see if anyone knows of any progress. They now have 11 days left, but I've not seen anything on Twitter regarding any progress pictures, which teams usually do, and on their website it says they're going to 'Try' to complete the works by the 31st March. Obviously their success in this or not changes entirely the play-off picture for any mid-table teams. It may just be that no news is good news as far as they are concerned. Vodka_Vic wrote: Just bumping this back up to see if anyone knows of any progress. They now have 11 days left, but I've not seen anything on Twitter regarding any progress pictures, which teams usually do, and on their website it says they're going to 'Try' to complete the works by the 31st March. Obviously their success in this or not changes entirely the play-off picture for any mid-table teams. It may just be that no news is good news as far as they are concerned. Well we'll be able to see their magnificent new seating when we go up there on Easter Monday!! No need for us to worry about them. Just let them crack on lads. No way will they not complete the seating on time and they are nailed on for the playoffs.York are the ones under threat with Southport,Stockport,Chorley and us in that order, but all we can do is keep on winning, we have to play 2 of those sides so you never know. Vodka_Vic wrote: Just bumping this back up to see if anyone knows of any progress. Clutching at straws are we? There has been no visual updates that I know of since February 17th (see below), largely due to them not playing at the Brewery Field since then! 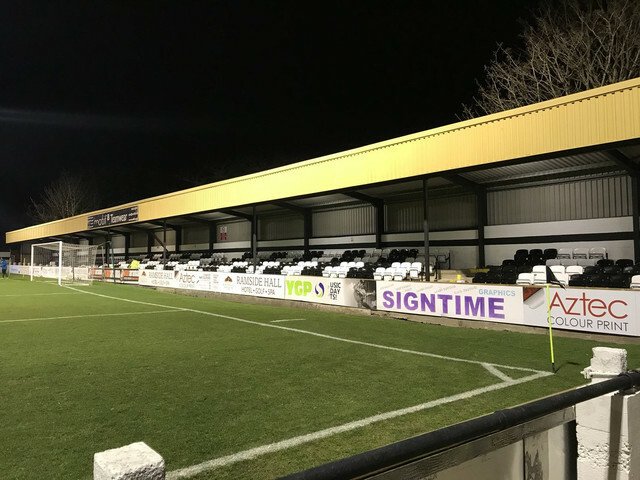 The Crowdfunder page to raise £10,000 from fans towards the redevelopment has so far brought in a total of £500 from 10 fans with ten days to go. But I believe they are also raising money from fundraising events and bucket collections to run alongside. As regards the work at the ground, I don't supposed they were helped by the two Beasts from the East that we have had, especially as they had quite a tight timeframe when they started on it. I actually want Spenny to complete the work and get there on merit. I don't want to happen to them what happened for us, although ironically our exposure to the stupid rule may have benefitted others to not make the same mistake. Chorley don't deserve to benefit 2 years in a row. As for potentially the 8th placed team getting in the play-offs, that isn't right either. *Due to travel delays for Leamington. Back of the class anyone who thought it was cos of crowd congestion. This is Spennymoor. A big 635 in attendance. Seats were in place behind the goal as well by all accounts. Spenny will make the playoffs and give it a good go, could be the top NE non league team next year. super_les_mcjannet wrote: Seats were in place behind the goal as well by all accounts. Spenny ... could be the top NE non league team next year. They won't be if they don't get out of NLN They'll be battling Pools and Blyth for second billing. I forgot about them too. It's easily done. Same with Hartlepool, hence why they could be the top NE non league team next season. You can add Blyth to that but only one of Spenny or Blyth can go up really. It was meant as in of they go up they could finish top out of all NE teams in non league next season. Fair play to them for beating the clock. If they did manage to navigate the play-offs and found themselves in the NL, even seven-figure Brad ( ) could find his commitment being stretched to the limit, given the limited ceiling on their support and the extra burdens involved at the higher level. Have the seats been installed in all of that stand behind the goal? Surely that'll reduce the atmosphere and also the capacity of the ground? Not that capacity is an issue unless a team brings a lot of away fans!! Image taken from Twitter from one of our fans who was there last night. Safe to say they will be playoff ready by next Saturday. Probably more interesting is that fight for the bottom few play off places as Chorley, Southport and Stockport have largely caught up with the pack. Does that increase the capacity? Hopefully we'll get more allocation for Easter Monday then. No it'll reduce the capacity, as you could get a good few more in that end when it was just terracing, before seats were installed and the capacity hasn't been increased anywhere else in the ground. I'd be surprised if the game isn't made all ticket, considering the likelihood of us bringing up a large following. Darlo_Pete wrote: No it'll reduce the capacity, as you could get a good few more in that end when it was just terracing, before seats were installed and the capacity hasn't been increased anywhere else in the ground. I'd be surprised if the game isn't made all ticket, considering the likelihood of us bringing up a large following. Also on twitter they're asking for help just to tidy the ground and paint certain areas. I'm guessing it's for the ground inspection. Wine and dine time! According to DJ last Friday, we are taking 8 stewards to help them out on Easter Monday!! At least they wouldn't have trouble meeting the rules for seating! Tonked 4-1 at Gainsborough today. What a strange division this is. Maybe the fixtures catching up with them? Vodka_Vic wrote: Maybe the fixtures catching up with them? Let's hope so, it's a pity they'll have an extra days rest on us before Monday.